Photo by Gage Skidmore (Creative Commons). Cross-posted from Sightline Institute, a sustainability think tank for the Pacific Northwest. Deep in the bowels of the Republican tax reform that took effect in the United States last year, its late-night authors buried a secret. The bill, as written, made one of the nation’s most economically and environmentally destructive fringe benefits—a free parking space for anyone who drives to work—21 percent more expensive for any private employer to provide. Did the authors of the bill, which skipped the scrutiny of Congress’s usual public hearing process, intend to include this bombshell? Who knows! What they did, technically speaking, is start taxing employer-provided “commuting benefits” as if they’re corporate profits. (Note that this change doesn’t affect personal taxes, which still have a different parking subsidy embedded. We’re talking here about corporate income taxes.) Maybe the authors thought they were just sticking it to companies that buy bus passes for their workers. The truth, of course, is that free parking is a commuting benefit like any other. And it’s worth a lot more money than transit fares or bike-share memberships—more than three times as much. An estimated 30 percent of American workers get the benefit. So in December, in accordance with the new US tax code, the IRS advanced its first-ever plan to assign corporate tax liability to parking and other commuting fringe benefits. Total anticipated federal revenue: $1.6 billion this year. For comparison, that’s a little more than the US government spends on food safety or about one-third of NASA’s annual space exploration budget. But some of that revenue, and the entire idea of treating commuting benefits evenhandedly in the corporate tax code, is at risk. The IRS draft regulations for the new law open two loopholes. Citizens, however, have a chance in the next week to tell the IRS to close those gaps—and a mobilization campaign that launched today is pushing for Congress to get involved, too. A for-profit parking lot in downtown Seattle. Photo by Derek Purdy (Creative Commons). How did this unlikely tax shift happen? It probably traces back to a scramble within the Republican party to keep one of Donald Trump’s off-the-cuff campaign promises. In a presidential debate with Hillary Clinton, Trump pledged a corporate tax rate of 15 percent—far less than the 28 percent rate that even anti-tax crusaders Americans for Tax Reform had long supported. Once in office, Trump started promising 20 percent instead. But even that higher figure required Congressional aides to scour the tax code for every possible revenue source to offset the losses of a lower rate. In short, to lower the rate, Congress had to find new things to tax. The aides found their way down to 21 percent—but not before coming up with the idea of taxing commuting benefits as if they were corporate profits. And that’s how the plain language of the US tax code came to imply that every private employer in the country that has a parking lot or garage must calculate what it pays to store the vehicles of employees who drive and then to pay taxes on that value every year. So perhaps the oddest fact in the story is this: The economic and environmental benefits of this little piece of tax reform could be huge. “The days of free and unaccounted-for employee parking are coming to an end,” said Jason Pavluchuk, a longtime lobbyist on commuting benefit issues now with the Coalition for Smarter Transportation. 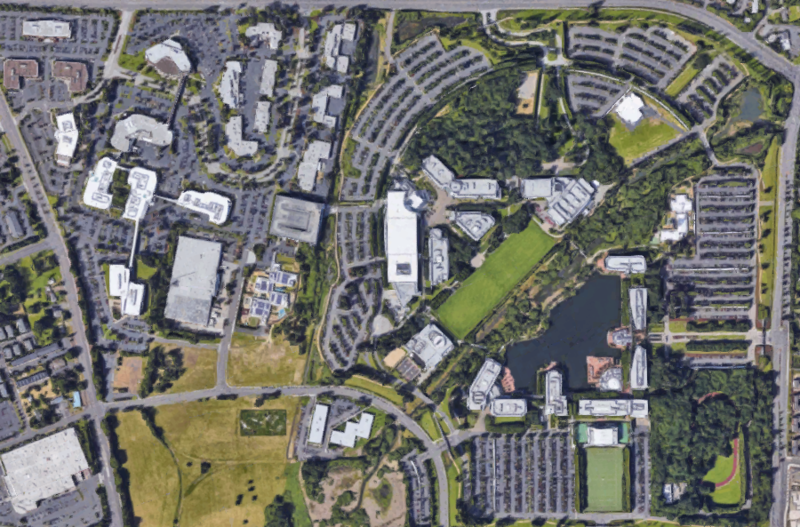 Nike World Headquarters in Beaverton, OR. Image: Google Maps. A well-enforced tax on corporations that subsidize employee parking would hit them where it counts: their bottom line. To be clear, the tax would also fall on transit benefits. But because free parking spaces are so much more expensive and common than free transit passes, a fully enforced tax on commute benefits would mostly fall on employers’ subsidies for driving. Ideally, it would convince many employers to completely rethink their commuting benefits and replace them with a universal cash payment … in other words, a raise. This would more equitably redistribute money that is currently subsidizing the decision to drive alone to work—letting employees opt to spend the money on closer-in housing, for example. A 2014 study from greater Washington, DC, estimated that an approach like this—eliminating all commuting fringe benefits, including free parking, so the money can go to wages instead—is 37 percent better at boosting transit use than providing a transit pass subsidy and free parking. Sadly, the IRS is not getting it right. In December, the agency proposed draft implementation details for the tax reform, which include a flawed calculation that underestimates the actual cost of providing parking—and thus preserves, and in some cases deepens, federal taxpayers’ parking subsidy. If it becomes formal policy, the IRS’s current draft would reward the approximately 49 percent of employers that build single-use parking lots and structures for their employees to use for free, while penalizing the 33 percent that share parking with others. Meanwhile, it would completely exempt many of the nation’s largest employers—Walmart, Kroger, Home Depot, to name three—from paying taxes on their own free employee parking. Worst of all, if any of those same companies were to offer commute benefits other than free parking, they’d still be penalized for it. The IRS proposes, in other words, to eliminate the tax exemption for green commute benefits, such as transit, but to leave it in place, at many businesses, for driving. The proposed IRS rule would reduce the projected $1.6 billion annual revenue from this part of the tax bill. No one has publicly calculated how much, though the US government calculates that employer parking reimbursements are about 75 percent of all commuting benefits. 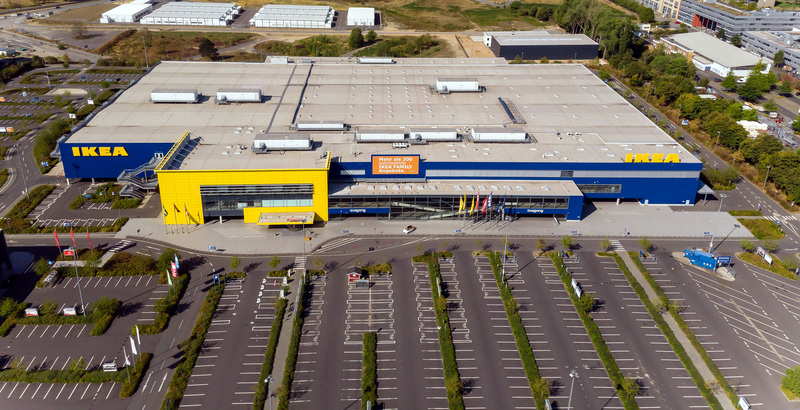 The IRS proposal would penalize employers like IKEA for offering transit benefits, but completely exempt them from from the new parking tax. Photo by Marco Verch (Creative Commons). So what, precisely, is wrong with the IRS’s December proposal? Two things. First, the law would let any corporation dodge the new parking tax if it offers free parking to employees and customers, as long as employees’ cars take up fewer than half the spaces. In other words, the IRS wants to completely exempt every “big box” retailer in the country—which is to say, the biggest employers in 23 states—from this tax on employee parking. But the IRS doesn’t hesitate to tax those same employers for whatever transit benefits they offer. Second, for employers that have large on-site parking areas specifically for employees (suburban corporate HQs, hospitals), the IRS recommends calculating tax liability using only the operating and maintenance costs of the lot: sweeping, ventilating, monitoring. Talk about one-eyed accounting! It’s like estimating the cost of homeownership based on the utility bills but not the mortgage payment. The Victoria Transport Policy Institute estimates, based on a 20-year payoff schedule, that a parking lot’s land and construction costs range from 49 percent to 86 percent of total costs. The IRS proposes to ignore these costs—essentially subsidizing them with taxes on employers whose workers ride transit, walk, bike or carpool. The good news: The IRS is asking for better ideas. Here are three. For transportation reformers, even the IRS’s flawed draft is probably an improvement over the status quo, because it would fall hardest on parking benefits in downtown business districts, where the alternatives to driving tend to be better. But the new loopholes it introduces are maddening—a little bit like drawing a winning lottery ticket and then learning that your payout will be in boxes of macaroni and cheese. But there’s hope. The IRS seems to realize its proposal is flawed, and it has asked for advice on how to do better. Today, Rep. Blumenauer’s office and Pavluchuk’s Coalition for Smarter Transportation circulated a draft letter of their own to the IRS, along with a call for the public to submit their own comments and—just as importantly—recruit their own members of Congress to co-sign Blumenauer’s. So, what better alternative approaches should the IRS be hearing about? The simplest way to improve the IRS proposal would be to reduce the number of employers it completely exempts from parking taxes. This would mean reducing the ratio for what the IRS calls the “primary use test.” The IRS has proposed a trigger of 50 percent: that is, if a company’s employees take up more than half the spaces in its general-purpose parking lot, the company must pay taxes on the costs of the lot, prorated to the amount filled by employees. But if employees take up less than half the lot, the company gets taxed as if it had zero auto commuters. There’s no reason for such a high threshold. Eliminating the “primary use test” or cutting it to (for example) 10 percent employee parking would sharply reduce the number of taxpayer-subsidized parking spaces across the United States. Another option: if an employer is exempt from parking taxes, then its other transportation benefits shouldn’t be taxable, either. Another important fix would be to require employers to count how many workers actually park on-site, rather than using “any reasonable method” to guess. If an employer doesn’t want to count, they should have the option to use a standard national average like 86 percent. A bigger, broader improvement would be for the IRS to recognize land and development costs as contributors to the cost of a parking space. Because this IRS deduction must be based on measurable cost to the employer, not value to the employee, it’s hard to quantify this true cost. Most of the cost is incurred up front, on the day a company buys its land or builds a parking garage. (In its proposal, the IRS declares that depreciation of an existing parking structure doesn’t count as a parking cost—a simple decision worth many billions of dollars to employers that own some of the nation’s trillions of dollars worth of parking structures.) Still, the IRS could offer two cost-estimate methods, one a thorough accounting, the other a set per-slot daily rate of perhaps $5, similar to the agency’s approach to vehicle mileage costs. The bottom line, though, is that the IRS has proposed regulations that would ignore something like half the cost of many employers’ parking benefits. Transit benefits and third-party parking, meanwhile, must fully pay their way. That decision would violate the plain language of the new US tax code. It’s up to the IRS to come up with regulations that implement the actual law. And it’s up to US citizens, in Cascadia and elsewhere, to hold the IRS to its duty. Sightline Institute is a think tank providing original analysis of energy, economic and environmental policy in the Pacific Northwest. You can subscribe to their free news service here. I’m skeptical that the law will have the effect of businesses actually accounting for the real costs of parking. We still live in a climate where almost everybody believes that parking is naturally free. Often beliefs overpower reality. And as the article states: only ongoing maintenance needs to figure into computing the cost of parking. Asset value (the largest component of parking cost) is left out. This could devolve into business pricing their parking spots at 25 cents per month. I hope I’m wrong, let’s see how this plays out. Is there a sample comment we could use? Forgive me if this sounds naive but the real issue with parking is how much space it takes up. So, given that these guidelines clearly favor big box stores with large surface lots, shouldn’t the tax be calculated based on the amount of gross square footage an employer takes up for parking rather than simply the number of spaces? 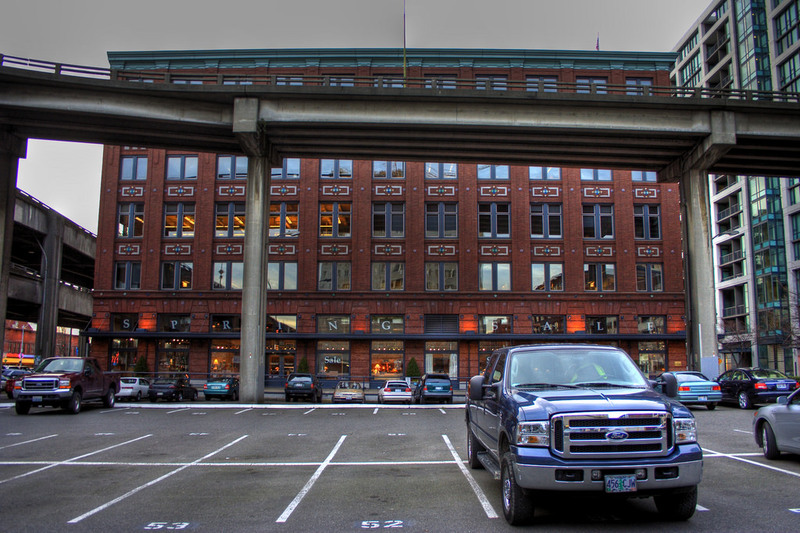 That way employers with structured parking, which costs significantly more to build and is a higher land use, are not unfairly overly-burdened. It would incentivize more shared parking programs between businesses and even pave the way for high-density robotic parking, an industry seriously lagging in the U.S.
Bike commuters would be able to write off $53 per month in related expenses, under a new House bill. Why Do We Still Pay People to Drive to Work? The federal government spends $7 billion annually subsidizing parking for car commuters -- almost as much as it spends annually on transit. No wonder cities are so congested. If we're going to cut traffic in major cities, parking subsidies have got to go. How Would Blumenauer’s New Commuter Benefit Proposal Work?